If you've added a Follow Me - Email module to your email template, this module can be quickly and easily customized right in the content editor. Learn how to edit follow me buttons for a specific email in the email editor. Hover over the email you want to edit and click Edit. In the left sidebar, click the module icon and select the Follow Me - Email module. Here you'll see any social networks you've added to this module on the template level. To edit an existing social network, hover over that network and click the edit icon edit. 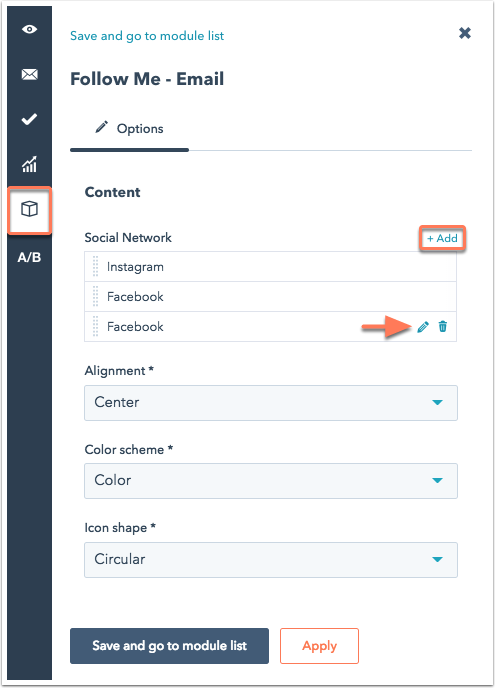 To add a new social network to your module, click + Add. A new Facebook social network will be added. Click the edit icon edit to edit this network's details. Use the dropdown menu to select a social network from the list of default options. There will be default icons for these social networks on the list. To use your own custom social icon, or to add a social network not included in the dropdown list, select Custom Icon. Click Replace to upload a custom icon image for this social network. Enter the URL for your company's social network. This is what the corresponding social network icon will link to. After you've made your selections, click Back to Follow Me - Email to return to the module editor. Once you've added all the social networks you want to include, you can customize the layout and appearance of your Follow Me - Email module. To reorder the social networks in your module, click on a social network to drag and drop it into place. Alignment - select whether the social network icons are aligned to the Left, Right, or Center of your email. Social network icons in this module are always laid out horizontally. Color scheme - select whether the icons should appear in Color, Black and white, or Grey. Icon shape - select Circular or Square icons. To see how your changes will be reflected in your email content, click Apply. 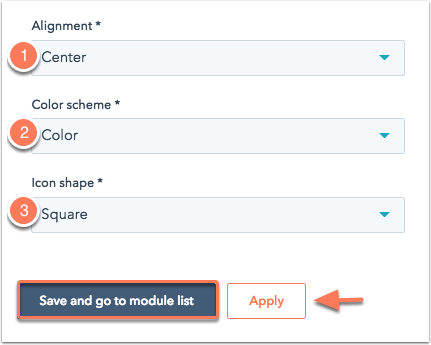 Once you've made your selections, click Save and go to module list to return to the email editor.